The Sandman was first published in 1817 as one of the stories in a collection called Die Nachtstucke (The Night Pieces) by E.T.A. Hoffmann. He was a German writer who formed an important link between Romanticism and the Gothic fiction of the later nineteenth century. His novel The Nutcracker and the Mouse was the basis for Tchaikovsky’s ballet The Nutcracker, and two of his other stories were turned into the ballet Coppelia. The Sandman was written in 1815 and has become famous as an early nineteenth-century horror story – for a number of reasons. First it is an excellent, if sometimes rather puzzling story in its own right. Second, it was used as the basis for a popular opera by the Jaques Offenbach in 1861 and then turned into an English ballet filmed by Michael Powell in 1951. Third, it was the subject of an essay written by Sigmund Freud in 1919 called The Uncanny in which he offers an interpretation of the story in psycho-analytic terms. This has become celebrated as an explanation of horror stories and their attractions. The principal element of the story that has attracted most attention is that of a human being who falls in love with a work of art – in this case a mannequin or mechanical doll. This is a story which goes back as far as Greek mythology. 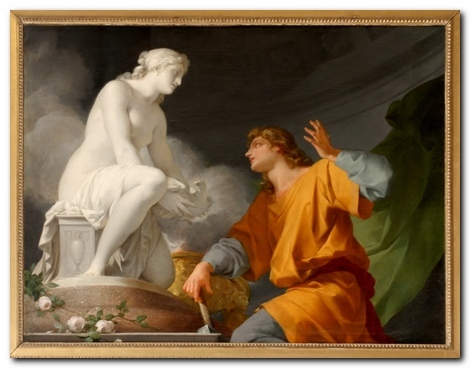 In Ovid’s Metamorphoses Pygmalion was a sculptor who fell in love with the statue of a beautiful woman (Galatea) that he had carved. This idea has been the basis of stories, poems, stage plays, paintings, operas, and ballets – as the Wikipedia entry demonstrates. However, this is only one element of The Sandman, and as you will see from the interpretation that follows, not its most important part. Olimpia the mechanical doll is an attractive feature of the story, but its deepest meanings are centred in the psychology of the protagonist, Nathaniel. 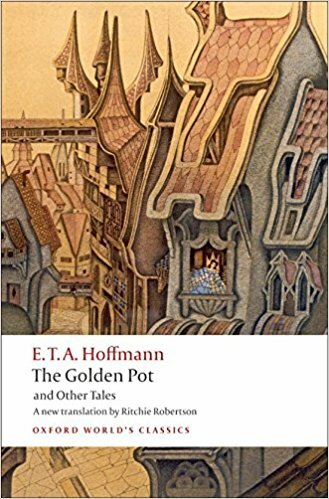 There is an interesting anomaly in Hoffman’s approach to the form of this narrative. The story begins as the exchange of three letters. The principal character Nathaniel writes to his friend Lothar describing the childhood origins of his fears and the menacing figures of Coppelius and Coppola (the Sandman). But he mistakenly mails the letter to his sweetheart Clara, who is Lothar’s sister. She replies suggesting that the evil figure Nathaniel sees in Coppelius is largely imaginary – a figment of his imagination. Nathaniel then reports to Lothar that he has taken up studies with Spalanzani, who has a very attractive daughter, Olimpia. Following this introduction the story reverts to a traditional third-person narrative mode. The story lends itself to a variety of interpretations. In his essay discussing the story, The Uncanny, Sigmund Freud has no hesitation in equating the Sandman’s threats to tear out Nathaniel’s eyes with an unconscious fear of castration. Freud also assumes that the source of this threat will be Nathaniel’s father. And it is true that the father and Coppelius not only act in unison, but are fused in Nathaniel’s mind. When Nathaniel feels he is being threatened by the two men (both dressed in long black smocks) his father “looked like Coppelius”. And even though the father is horribly disfigured as a result of the household explosion, he returns to his normally serene appearance in his coffin: “his features were once again as mild and gentle as they had been during his life”. There is therefore a strong case to be made for a psychological transference between the father and Coppelius as castration threats on Nathaniel’s part. But this explanation seems to leave a number of important questions unanswered. For instance, why does Nathaniel fall in love with an automaton? And why does he end up killing himself? These questions are answerable with a slightly more nuanced, though still psycho-analytic interpretation. This approach sees Nathaniel as in fear of female sexuality. He claims to be in love with Clara, but when she moves to live in his father’s house, he has the most serious attack of subliminal fear centred on the figure of the Sandman. Moreover, Clara is not particularly attractive, and he finds her cold and unresponsive. In fact he is attracted to women who are impassive. This explains the curious detail of Nathaniel mailing the first letter by ‘mistake’ to Clara instead of Lothar. Nathaniel is not aware that the figure of Coppelius (later Coppola) is a metaphor of his sexual fears. He thinks of him merely as an ugly and menacing figure who is threatening to put hot coals in his eyes. But at an unconscious level Nathaniel wishes to avoid the sexual intimacy that marriage to Clara would involve. So he gives a full account of the origins of his psychological problem and mails it to the person for whom it has the greatest relevance – Clara, the woman he fears he is expected to marry. The poem he writes about their marriage reveals his secret fears – that the event will be to him a form of death. This is in fact the second ‘warning’ he conveys to her. She dismisses the poem out of hand, offering him a perfectly reasonable explanation for his fears – telling him they lie within himself (which is true). But he rejects her suggestions. In fact he rejects them twice – just as he twice selects a cold and unresponsive female as the object of his love. The second instance of his choosing is even more intractably unresponsive, since she is in fact an automated doll. Nathaniel also falls in love with Olimpia by viewing her through a pocket telescope – a device guaranteed to keep him at a distance from the object of his affection and the source of his secret fears. 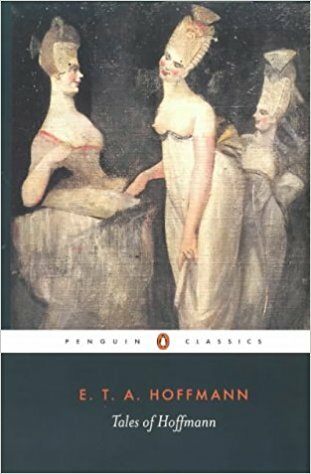 Nevertheless, Nathaniel actually decides he wants to marry Olimpia, but when he approaches her, wedding ring at the ready, he collapses into another nervous fit, apparently brought on by the appearance of the evil Coppelius, the embodiment of his fear of female sexuality. But his fainting fit is his unconscious (but well-conceived) avoidance strategy for what he fears most – sexual intimacy. Having recovered from his indisposition a second time, he is presented via an inheritance with a ready-made family home and estate. All he needs to do is marry Clara, who is still reassuring him. He takes her up the town hall tower to look into their future – the countryside, where their home is located. At this very moment it looks as if his fate is sealed: he cannot escape matrimony and its sexual implications. So he conjures up the vision of Coppelius again (using the pocket telescope he has bought from him). Anyone sceptical about this interpretation should observe carefully what happens next. Nathaniel sees Woman and Marriage as a threat – so his first impulse is to remove the cause of this existential fear. He tries to throw Clara off the tower into the market square below. But this manoeuvre is thwarted by the arrival of Clara’s brother Lothar, who eventually saves her. It should be noted however, that Nathaniel whilst climbing the tower has locked behind him not just one but two doors leading to the parapet. This suggests rather strongly that he has gone up the tower with some sort of pre-meditated evil intention. Having failed to remove the source of the threat by killing Clara, he then takes the only alternative open to him – he removes himself from the threat by plunging to his death below. As if to underscore this interpretation of events, the story concludes some years later with a pastoral idyll in which Clara is happily married to a handsome young man with whom she has two young children. This is the very scenario which embodies all Nathaniel’s poorly suppressed fears. So the story is not about a man who falls in love with a mechanical doll, but a parable of the fear of domestic intimacy and the socio-psychological price that must be paid to enjoy it. Nathaniel writes from university to his friend Lothar after a disturbing incident involving someone he recognises from the past. He recalls childhood memories of being sent to bed early with the threat that ‘the Sandman is coming’. He is told that the Sandman throws sand into children’s eyes, which jump out of their heads and are fed to his own offspring, who have hooked beaks like owls which they use to pluck out the eyes of naughty children. Nathaniel’s mother tried to reassure him that there was no such person as the Sandman, but the image remained alive in Nathaniel’s mind. He heard the Sandman climbing the stairs to visit his father, and one night hid in the room to confirm his fears. The Sandman turned out to be a hideous lawyer Coppelius who threatened to put burning coals into Nathaniel’s eyes. His father pleaded for mercy, and Nathaniel fell into a swoon. Coppelius disappeared from the town. Nathaniel mistakenly posts his letter to Clara, Lothar’s sister. Clara in her letter of reply suggests that Nathaniel’s continuing fears are imaginary. She argues that Evil lies within the Self, and it is in Nathaniel’s own power to shake off the Sandman’s pernicious influence. Nathaniel replies to Lothar rejecting Clara’s advice. He reports on a new enthusiasm for Professor Spalanzani and his beautiful daughter Olimpia. An outer narrator then takes over the narrative, describing the difficulties of representing uncanny experiences. The story backtracks to describe Clara and her brother Lothar moving to live in Nathaniel’s family home. Nathaniel is engaged to marry Clara, but he leaves to study at the city of G***. When he returns home, Clara continues to argue that Nathaniel can overcome the malign influence within himself. He is irritated by her coldness and unresponsiveness. Nathaniel writes a dramatic poem describing his wedding to Clara and Coppelius’s disruption of it that reveals Clara to him as an image of death. Nathaniel reads the poem to her: she tells him to throw it in the fire. They quarrel; Lothar rebukes him; but all three are eventually reconciled. On his return to G*** Nathaniel lives opposite Spalanzani and his statuesque daughter Olimpia. Nathaniel is visited by Coppola, who tries to sell him spectacles. Nathaniel buys a telescope from him instead. When Spalanzani gives a ball. Nathaniel dances with Olimpia and makes overtures of love to her, oblivious to everyone else’s amusement. Following this he reads his poetry to her and eventually decides to marry her. But when he arrives at her house with a wedding ring, Coppelius is arguing with Spalanzani over possession of Olimpia, who is revealed as a mechanical automaton. Nathaniel goes mad with fury and is taken off to a lunatic asylum. Nathaniel awakes from a dangerous illness in his father’s house where he is being tended by Clara. The family unexpectedly inherit an estate from a distant relative. Clara and Nathaniel climb the tower of the town hall to view the countryside. Nathaniel finds the telescope in his pocket and immediately tries to throw Clara off the tower. She is saved by Lothar, but Nathaniel sees Coppelius in the crowd below and throws himself off the tower to his death. Some years later Clara is happily married with two small children.